The Jewish Museum's Scheuer Auditorium. This ensemble combines Appalachian and southern fiddle tunes with Eastern European klezmer melodies to create a soulful sound and a foot-stomping good time. 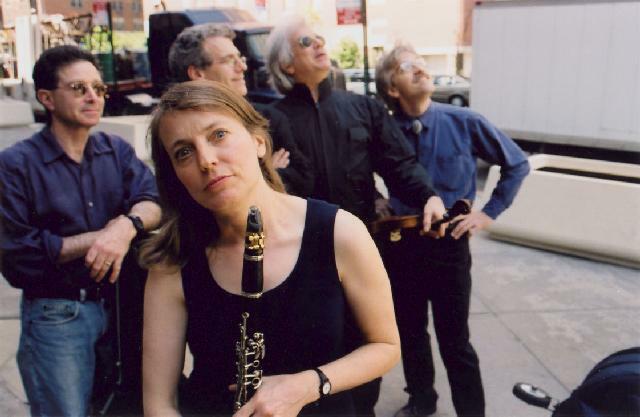 Virtuoso clarinetist Margot Leverett adds depth and complexity to the raw and spirited energy of The Klezmer Mountain Boys. Tickets: $15 for the general public; $12 for students and seniors. seront animés par des artistes de renommée internationale. Enjoy daily "community singing" and participate in an "instant choir"
If you love Jewish music you've got to be there! TICKETS: $15 for members of the 14th Street Y; $20 for nonmembers. Special Metropolitan Klezmer quartet show, up on the roof! (The concert will be held indoors in the event of rain.) Wine & cheese reception follows the one-hour performance. Babysitting will be provided upon advance request. Brash and strong as slivovitz, these nine musicians forge virtuostic new brass band music in the heart of New York City, melding Gypsy, East European, Mexican, and Asian immigrant backgrounds with American jazz and soul. Eastern-European and Gypsy melodies, Latin rhythms, Jazz-inspired improvisations, and deeply rooted Classical forms are given new meanings in original compositions that fearlessly forge a new direction, with a nostalgic gaze towards the past. The largest free folk festival in the nation is happening once again this summer, from July 24-26, 2009 in Lowell, Massachusetts. The Lowell Folk Festival has brought an international array of folk music, ethnic foods, craftspeople and artisans to New England every summer for more than 20 years! 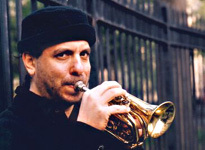 One of the featured bands at this year's festival is Frank London's Klezmer Brass All-Stars. Fri 7/24, 6:40-10pm; Sat 7/25, 12-10pm; Sun 7/26, 12-6pm at the Lowell National Historical Park in downtown Lowell. Klezmer workshop,summer 2009 in France. August. A week of work and a little concert at the end. All information on our website. Divahnss innovative all-female Middle Eastern-style ensemble has engendered an international following, infusing traditional and original Jewish songs with sophisticated harmonies, entrancing improvisations, and funky arrangements. 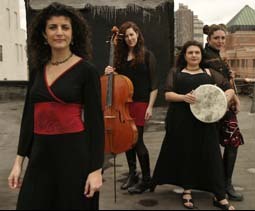 The group's thrilling live shows include eclectic instruments such as tabla, qanun, cello, violin, doumbek, and vocals spanning Hebrew, Judeo-Spanish, Persian, Arabic, and Aramaic. July 28, 2009, 7:30 p.m.